Classes started last week, just as they have for the past ten years I’ve been teaching. There’s always something different–a new syllabus or classroom, a new office or a new class blog, and always there are new students, familiar but different, and each group has to find its own chemistry. Sometimes, though, a new semester means something earth-shatteringly new that makes everything different. Like this past week, when I got an email the day before the new semester began announcing a free shuttle service between downtown Baltimore and UMBC. Wow. This is a game-changer for so many of us–or at least enough of us to justify the expense and to make them keep the shuttle line. My excitement was not without some reservation. Did I really want to support the privatization of what should be a public service–a bus line from the city to campus that everyone could use? What if Brompty feels lonely as I ride the Surly downtown and back everyday? Is there a good ride north from the west side, one that avoids heavy traffic and long hills? Would I be able to find the shuttle stop? I pushed all that aside on Friday and took the Surly downtown, a super-quick 20 minutes, mostly downhill. I found a gazillion bike racks right outside the University of Maryland Medical Center building and locked up to the rack, only a little nervous to leave my baby alone all day. And then I waited, checking the app that tracks the bus, getting increasingly excited as the dot moved closer to me. I struck up a conversation with a student who looked like he was headed my way, and we chatted about bikes and how much we wish the shuttle would make just one stop farther north. And then we were on the shuttle, zooming with two other passengers toward campus. The first stop let me off at my building, and I was officially sold on the new commute. The way back was less smooth, mostly because the shuttle faces that scourge of all road travelers: traffic. It was late, we were late, and I realized I’d have to have more faith in the tracking app to cut down on my wait time at the stop, or I’d be one frustrated little commuter bunny. The ride back up to home was a bit tricky, but it was all new westside sights, and I’ll take them as I figure out the best way home. I’ll stick with the Brompty and MARC for days when I have to stay late and want a shorter ride home at night, but I’m thinking this new commute (which saves me $100 a month in MARC fees and lets me stretch my legs on the bike a bit longer) will be a new favorite. Oh, the thrills of being a flexible multimodal commuter! 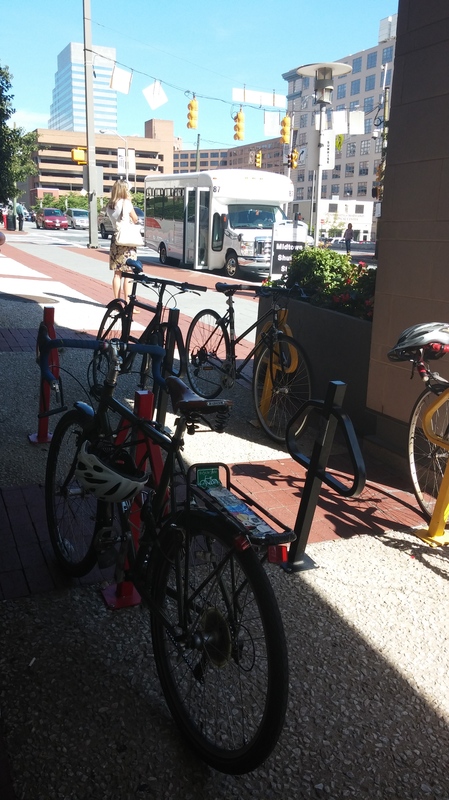 This entry was posted in bikes, commuting, personal and tagged Baltimore, downtown shuttle, multimodal commute, shuttles, UMBC, Westside. Bookmark the permalink. Great review! I will start using it soon!